Outside bars as trend bars? If you have any questions or suggestions you are welcome to join our forum discussion about Outside Bars. Outside bars are a relatively complicated formation to trade. This is a bar whose high is above the high of the previous bar, while its low is beneath the low of the previous bar. It basically engulfs the previous bar. Outside bars are difficult to interpret because they very much depend on the context in which they occur. Because the outside bar has a larger size compared to the previous one, it suggests that both the bulls and the bears were in control at some point of that period and that they were pushing more aggressively. This adds a high chance of further reversals in movement over the next few bars. If the outside bar closes near its middle, it is basically a one-bar trading range. Such bars are highlighted on the screenshot below. As you can see from the example, a decent amount of outside bars can be seen at a chart at any time, but they alone don’t tell us much, especially if the market is in such a distinctive trading range like pictured above. You can see several outside bars pointed by the arrows, which close near their middle and are basically one-bar trading ranges, which adds to the overall sideways trading. Most of these outside bars even form inside-outside-inside patterns as well (we will discuss those later in the article), but due to the trading range, they do not provide reliable enough entry signals. And because outside bars are an indication that the market is moving sideways, thus, everyone will sell near the top of the range and buy near its bottom, it would not be wise to use them as entry points, unless they are followed by a small bar near their high or low that would mark a breakout attempt. If the market breaks out in either direction, you should look to enter against it, because outside bar breakouts usually fail within a few bars. Outside bars are very useful as entry points when the preceding bars give away a reliable signal. For example, if the trader expects a major reversal during a bullish trend and a strong bearish bar occurs, but the next bar trades higher, you should keep your sell stop in place. If the market suddenly reverses and forms an outside bar, your order will be executed, thus, making it an entry bar. Outside bars can act as an entry bar at the bottom or the top of corrections. Take a look at the following screenshot. You can see in the example above that an outside up bar formed after a two-legged correction in a strong uptrend, which is a reliable long entry signal. Moreover, there were several bullish candles close before it that provided some additional strength. Adding to that strength, the bar closed near its high, while opening close to its low, suggesting bulls were pushing the market up. Traders would want to go long as soon as the outside bar goes beyond the previous bar’s high or just wait for it to close and buy above its own high. In certain cases, outside bars can be seen as strong trend bars instead of range bars. 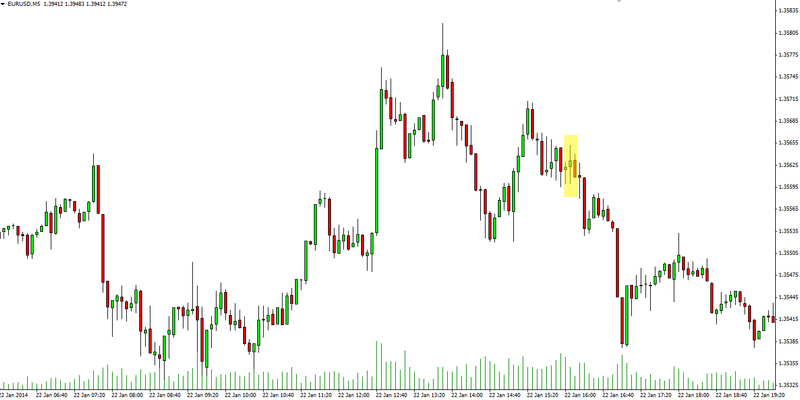 This can be observed when a with-trend outside bar occurs at a reversal from a strong trend. If, for example, we have a bearish trend followed by a strong upward correction, market players will be looking for a rise in the price. Less traders will sell below the previous bar’s low and more will buy above its high, as it marks a higher low. If they feel especially confident, bulls can act even more aggressively and buy below the previous bar’s low, instead of above its high, thus, increasing the bullish sentiment. This will push the current bar’s high above the prior one’s, thus, making it an outside up bar. Once that happens, trapped bears who shorted below the previous bar’s low will cover their shorts, pushing prices even higher, and will stay away from the market for some time. With bears exiting the market, and overall sentiment being predominantly bullish, the market will keep rallying. If the reversal is too strong, it will form a second leg up after a pullback. There are usually two legs up from the bottom of the outside bar. The strength of such a reversal is explained by the impatience of both bulls and bears. As the price reverses upward after bears have shorted below the previous bar’s low and traps them in, some bulls are trapped out because they don’t like entering during the formation of outside bars. Both sides want to see the price going down, so that bears can reduce their losses and bulls can enter long positions and profit now that sentiment has turned bullish. However, because all market participants want the same thing, it will not happen, since both counterparts will impatiently buy as soon as the price declines by several pips, instead of waiting for it to decline by 1-2 bars. 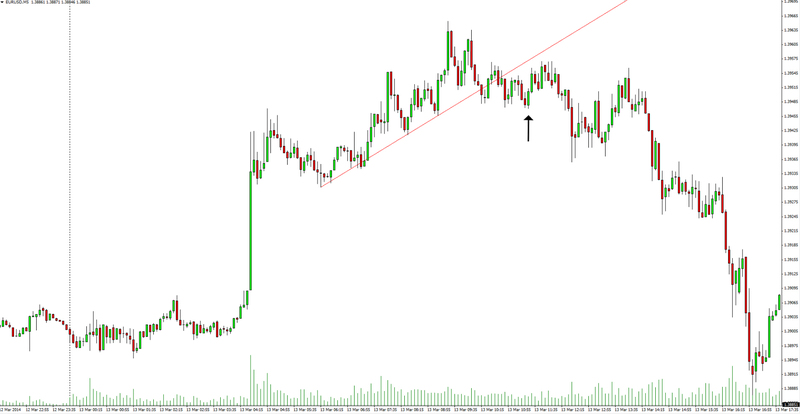 This will push the price even higher, leading to that strong move we discussed. In the next article we shall talk about the inside-inside and its more reliable version, the inside-inside-inside pattern. If between the two inside bars of an inside-inside pattern lies an outside bar, then we have an inside-outside-inside pattern. This formation signals an entry in the direction of the breakout of the second inside candle. However, in order to safely trade it, you will need to be sure that the market movement will be wide enough to reach your profit target. As we’ve already mentioned, outside bars are pretty tricky, so logically patterns made out of them cannot be interpreted straightforward as well. If, for example, the second inside bar is large and near the middle of the outside bar, then this signals that the market is still in some balance and you would be better off waiting for a stronger setup. On the example above you can see an inside-outside-inside pattern forming several bars after a two-bar bearish reversal. Although it looks like a trading range which includes a couple of doji bars, the market is clearly forming lower highs and lower lows. Moreover, the highlighted inside-outside-inside pattern ends with a bearish bar with a shaved bottom, an indication the bears are pushing down the market. A short entry below the bearish bar, or even below the whole pattern for extra safety, would be a reasonable order. Such a stronger setup can occur when the inside-outside-inside pattern forms at a new swing high or low and the second inside bar closes respectively near its low or high, suggesting that a breakout is very possible. Why Should You Trade Based on Price Action?